Russian design studio BIO Architects recently completed yet another beautiful modular home, the latest from their DublDom series of prefabricated homes that are both modern and budget-friendly. 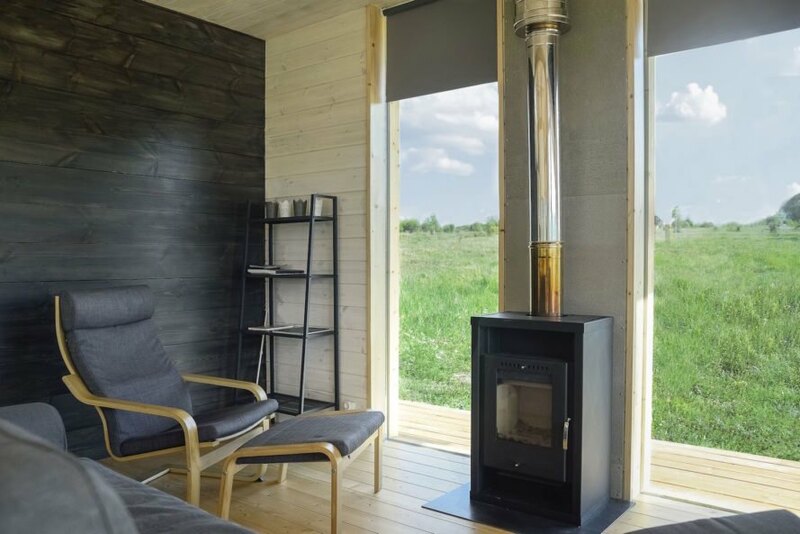 Installed in the Eco-park “Yasnopole” in the Russian countryside, the DublDom 2.65 was commissioned by the Eco-park founder, who will use DublDom as the first example of the homes he hopes to install in the region. The contemporary timber home was prefabricated off-site in a month and placed on site in just one week. Completed for a budget of $42,500, this particular DublDom 2.65 model offers 65 square meters of space with enough room for two spacious bedrooms, a veranda, and common areas. 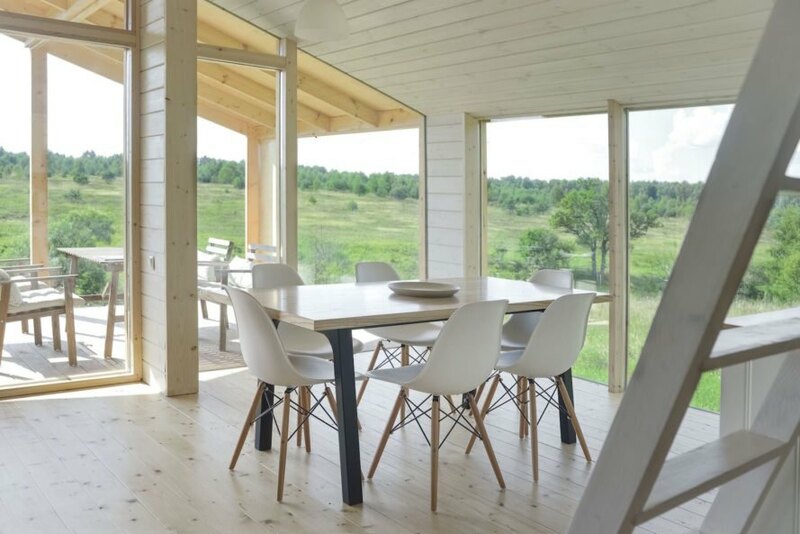 Like all of BIO Architects’ modular homes, the EcoPark home was built mostly from wood for a cozy and welcoming feel. Large double-glazed windows let in natural light and frame panoramic views of the outdoors. The light-filled gabled home is minimally decorated with black metal and unpainted larch that line the exterior and parts of the interior. BIO Architects offers five different configurations of the DublDom 2.65; the Eco-Park client chose DublDom 2.65-01, which includes a spacious front veranda that wraps around the sides of the home and includes a small terrace in the rear; an open-plan kitchen, living, and dining area; a bathroom; and two equal-sized bedrooms. The house is elevated on stilts and was installed on site in seven days. Completed for a budget of $42,500, this particular DublDom 2.65 model offers 65 square meters of space with enough room for two spacious bedrooms, a veranda, and common areas. 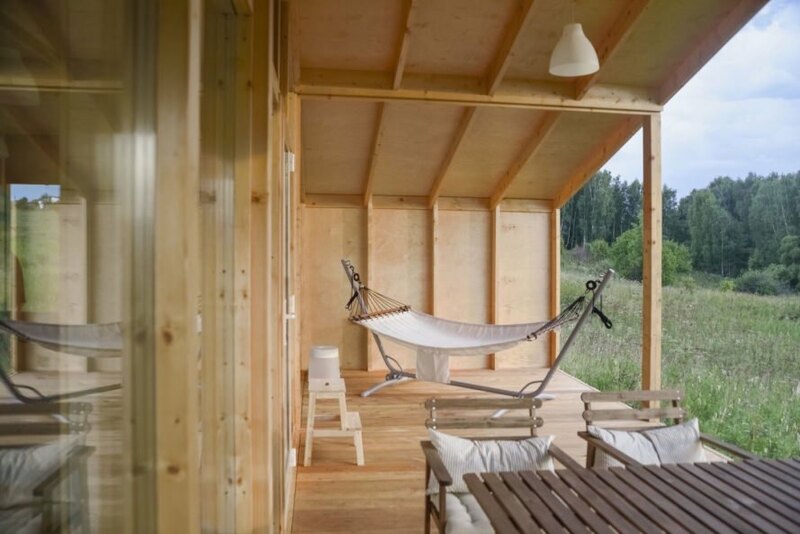 Like all of BIO Architects’ modular homes, the EcoPark home was built mostly from wood for a cozy and welcoming feel. Large double-glazed windows let in natural light and frame panoramic views of the outdoors. The light-filled gabled home is minimally decorated with black metal and unpainted larch that line the exterior and parts of the interior. The house is elevated on stilts and was installed on site in seven days.